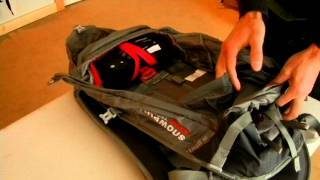 Here’s some details on the Mammut Light 30L PAS. The Light Protection Airbag is Mammut’s featherweight among protection airbags. With the Protection Airbag System, the avalanche airbag weighs just 2120 kg. The top loader backpack offers everything you would expect from a good one-day touring backpack. Very comfortable to carry, with attachments for skis, a snowboard, axe and ski poles. The large zip at the front allows much easier access to the main compartment.